This dominating sire from the timeless Rito performance lineage has established himself as a true breed legend and a powerful breeding bull, perhaps unlike any other identified. His progeny display unusual muscle density, masculinity, rib shape, and overall dimension with enhanced breed character. Used over the course of the past decade and a half in the SpringLake program, and being a home grown SpringLake Angus calf, he has left a strong influence with daughters in production that are exceptional in terms of their foraging ability, fleshing ease and foot quality. At Schaff Valley Angus, his first progeny were the heaviest weaning and yearling weight sire group of the 2009 SAV calf crop and the record-selling sire group of bulls in the 2010 SAV Sale, including SAV 707 Rito 9969, the $147,500 second top-seller, and SAV Eliminator 9105, the $95,000 fourth top-seller. In the 2012 SAV Sale, Rito 7075 progeny were back by popular demand and included SAV Resource 1441, the $110,000 fourth top-seller, while his progeny in the 2013 SAV Sale were headlined by the $90,000 SAV Registry 2831, and his progeny in the 2014 SAV Sale included SAV Renown 3439, the $175,000 leadoff bull, and the $80,000 SAV Recharge 3436. In SAV sales through 2015, a total of 110 sons have averaged $18,252 while 327 grandsons have averaged $19,814. His productive daughters are among the most valuable females in existence in the breed today and they also include a multitude of top-sellers and the dams of top-sellers. 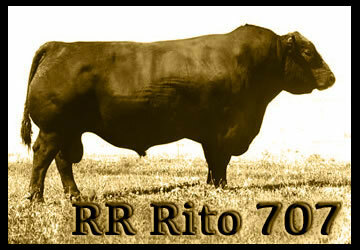 Rito 7075 is fortified with a solid performance pedigree, tracing 39 times to the legendary Pathfinder Sire, RR Rito 707, and 53 times to Rito N Bar, an original Certified Meat Sire. Born nearly 50 years ago in 1967, RR Rito 707 established himself as a common denominator in most performance bloodlines that continue to be prevalent in the Angus breed today. He dominated the 1968 PIC Bull Test at Stanford, Montana, as the top yearling weight and top gaining bull with a gain ratio of 129 and sold two-thirds interest for $5,000 as the top-selling bull to American Breeders Service AI Stud of Wisconsin and Pioneer Beef Cattle of Iowa. His very first progeny test group of 27 steers recorded an average daily gain ratio of 111 and graded USDA Choice. The progeny enrolled in the AHIR program over the course of the past four decades by this pioneer performance sire continue to compile an impressive average weaning ratio of 105, while his daughters in production post a strong collective weaning ratio of 102. 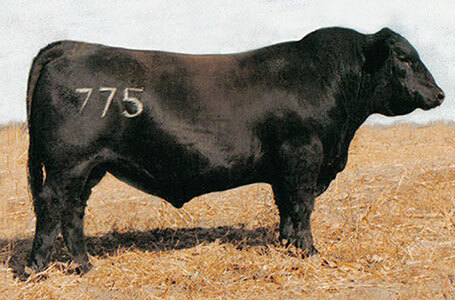 A decade and a half after RR Rito 707 became an ABS sire, he could be found in one-third of the top 75 bulls in the 1984 National Sire Evaluation, a record that was not approached by any other sire of the time and has since been cemented into the foundation of most modern day performance bloodlines. RR Rito remains the breed’s top proven sire for his generation and beyond with a weaning weight nearly 40 pounds greater than the estimated average of his birth year and a yearling weight nearly 70 pounds greater.